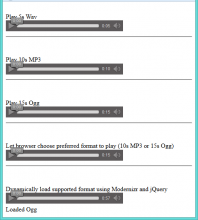 All example code, graphics, and audio are free for personal or commercial use with no royalties. Engines distributed with respect to their licenses. This very simple pong game was written in pure HTML5. There are no dependencies. 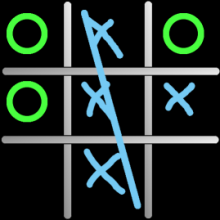 Tic-Tac-Toe implemented in EaselJS and CreateJS tool suite. Crafty Pong was developed using the Crafty game engine. To play, drop bricks to center the marble inside the flying ring. Don't lose a marble! Sky Marble was developed using the Turbulenz 3D Game Engine. It features 2D physics with 3D effects. MechaJet supports keyboard, mouse, and touch inputs. There is no end as levels 1 and 2 repeat forever. MechaJet was written using the Impact game engine.